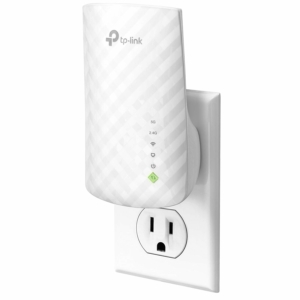 If you are unable to sit in your favorite recliner and surf the Web due to having a weak Wi-Fi signal, then it is time for you to think about getting a range extender installed like the TP-Link AC750 (RE200). It is a dual-band extender that is plugged in to a wall outlet to provide Wi-Fi connectivity to the dead spots that your main wireless router cannot reach. It is easy to install, affordable, and provides good 5 GHz throughput. However, its 2.4 GHz performance in tests did suffer the further away we moved from it, and it is also lacking in pass-through capabilities and a USB. If it is within your budget, the NETGEAR Nighthawk AC1900 (EX7000), which is our top choice, comes loaded with features and provides higher all-around performance. However, it is a bit more expensive. In two-socket outlets, its two-prong plug doesn’t block the second socket. Dual-band networking (5 GHz and 2.4 GHz) is supported by the extender and works with 802.11b/g/n/ac routers. On the bottom there is one gigabit LAN port and on each side are two high-gain, foldable antennas. On the front part of the extender are for LED indicators (WPS, 5 GHz, 2.4 GHz, and Power), and on the left hand side a WPS and Power button. On the right hand side there is a reset button, and button for turning the LED indicators off and on. A Web-based management console is offered by the RE200, with lots of router-like setting. On the Network menu you are able to change the LAN settings like Gateway, Subnet Mask, and IP address, and the extender can also act as the DHCP server so that IP addresses can be assigned to wireless clients You can also change the DHCP lease times and DNS addresses here, and look at the DHCP client list as well. The Wireless settings menu allows you to change the SSID on both bands, control user access to its MAC Address Filtering sub menu, and a security protocol can be assigned (WEP, WPA2, or WPA). Several advanced wireless settings are offered, including adjustments for Fragment Threshold, RTS Threshold, and Beacon Interval. The Systems Tool menu provides Backup and Restore as well as Firmware Upgrade options, along with a Reboot and System Log option. Like the Amped Wireless REC33A and Linksys RE6700, it is very easy to install the RE200. Begin by taking your new device and plugging it into a wall outlet. Then type http://tplinkrepeater.net into the address bar of your browser on your computer. Doing that launches a wizard that scans for networks that are available. It displays each network’s security protocol, channel, MAC address, signal strength and SSID. Next, select your network and then type in a name for your extended network, or you can use the settings and name of your router. You can also choose a password and security protocol here. You do this for both of the bands if you are connecting with a dual-band router. To finish the setup process, review all of your settings and then click on finish. In our testing, for the most part, the RE200 did deliver decent throughput on the 2.4 GHz band. However, on long-distance transmissions, it did have some difficulties. On close-proximity (or same room) test, it had a 32.5 Mbps score, which was similar to the 39 Mbps score of the D-Link DAP-1650, but lagged behind the 93.5 Mbps score of the Linksys RE6700 and 89.1 Mbps of the Amped Wireless, while the Netgear EX7000 had a 50.2 Mbps score. The RE200 had a 23 Mbps score at 25 feet and 21.2 Mbps at 25 feet, with the Amped REC33A having scores of 32.9 Mbps and 7.8 Mbps. The Linksys RE6700 had a 38.2 Mbps score at 25 feet, and a 14.4 Mbps score at 50 feet, and the NETGEAR EX7000 had a 38.8 Mbps score at 25 feet and a 28.6 Mbps score at 50 feet. At 75 feet the RE200 did stumble with just a 7.4 Mbps score. The Amped REC33A only had a 11.3 Mbps, while the Netgear EX7000 had a steady score of 26.9 Mbps. On our 5 GHz close proximity test the RE200 had a middling throughput score of 74.5 Mbps, while the Amped REC33A came in at 210 Mbps and the Linksys RE6700 at 177 Mbps. On the 25-foot test, the RE200 had a 65 Mbps score, which was similar to the 67.8 Mbps score of the Linksys RE6700, while the Netgear EX7000 had a 137 Mbps score and the Amped REC33A had a 107 Mbps score. The RE200 recovered at 50 feet with a 29.2 Mbps score and at 75 feet with a 27.9 Mbps score, which beat out the Linksys RE6700 scores of 18.3 Mbps and 3.1 Mbps, while the Amped REC33A had a 8.8 Mbps score at 50 feet and at 75 feet no signal. The Netgear EX7000 is still our fastest extender with 105 Mbps and 31.1 Mbps scores. The TP-Link AC750 RE200 is a good choice for users who are on a budget who need to have their Wi-Fi coverage extended. It installs quickly and offers a good selection of management settings and good 5 GHz throughput. Although it does have decent 2.4 GHz performance, with distance it does deteriorate. Like the Amped Wireless REC33A and Linksys RE6700, one wired LAN port is offered by the RE200 to connect to devices such as gaming consoles and Smart HDTVs, but it is lacking in additional LAN ports and USB connectivity. If you would like to share a USB drive’s content across your network or need to connect to multiple devices, then your best option is the Network Nighthawk AC1900 EX7000, which is our top choice for range extenders. It provides a USB port, five LAN ports, and superior performance. However, compared to the RE200 it does cost more and isn’t as compact.